In relation to where the left thumb is positioned on the grip of the club, where the grip will reside inside the left hand can also vary. 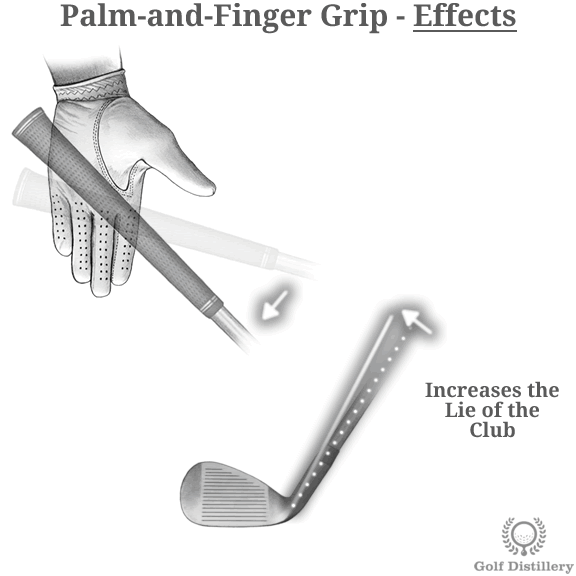 Indeed, a golf grip can be further characterized by how close the grip of the club lines up with the base of the fingers and with the palm of your hand. Both types of grips are explained below. 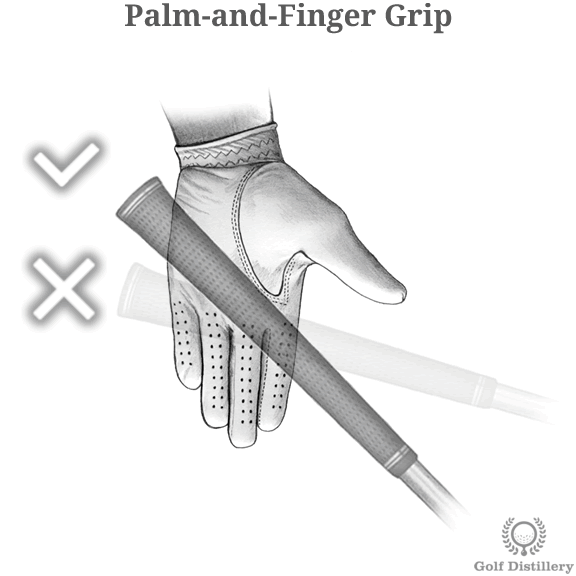 As its name implies a palm and finger grip will see the grip of the club pressed against both the fingers and the palm of the hand. On the low end the grip will be held in place by the inside of the middle knuckle of the index finger. On the top end the grip will be held in place by the fatter pad of your hand, which will be pressed against it. Naturally, the rest of the club will line up between these two end points and will result in a grip that crosses your hands in a diagonal fashion. 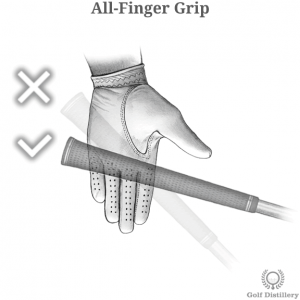 This type of grip was famously recommended by Ben Hogan who allocated a full chapter to its careful instructions in his bestseller “Ben Hogan’s Five Lessons – The Modern Fundamentals of Golf” (amazon link). In order to adopt a palm and finger grip you’ll likely begin by placing your left thumb in a short thumb fashion. Indeed, a palm and finger grip is most comfortable and natural with a short left thumb position. And because of this, the grip comes with its associated features of shorter swing amplitude and somewhat restricted club movement at the top, all in contrast to a long left thumb position. Additionally, the palm and finger grip promotes an upright club lie. 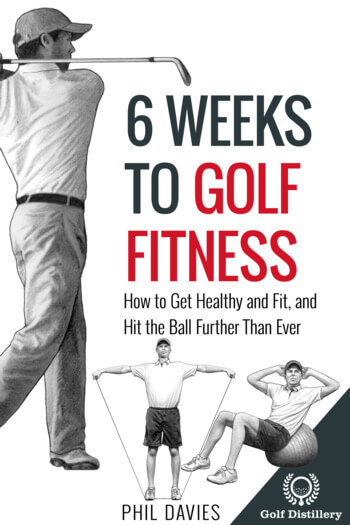 Indeed, by running diagonally inside the left hand the club shoots down towards the ground at a steep angle. Finally a word of caution. 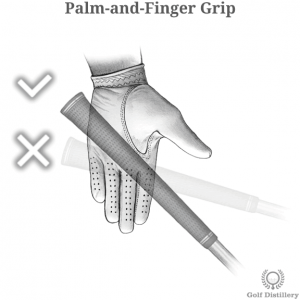 Golfers with such a grip type should be careful to keep it from moving too far into the palm of the hands. Indeed, the placement of the club inside the hands can vary, ever so slightly each time but over a long enough time horizon it can result into a woefully flawed grip. The all-fingers grip is a type of finger placement that sees the left hand gripping the club towards the junction of the fingers and the hands, inside the first knuckles. Indeed, the lower end of the grip will be pressed against the first knuckle of the index finger while the top portion will rest against the inside of the little finger’s first knuckle. As such, the club will be held in a straight line at the base of the fingers. An all-fingers grip is associated with a long left thumb setup as it is most natural and comfortable that way. Because of this, the features of the long thumb are transferred onto the all-fingers grip. Notably, a full swing amplitude allowed by an unconstrained hinge at the top of the swing features prominently. Additionally, it should be noted that such a grip type promotes a shallower club lie. 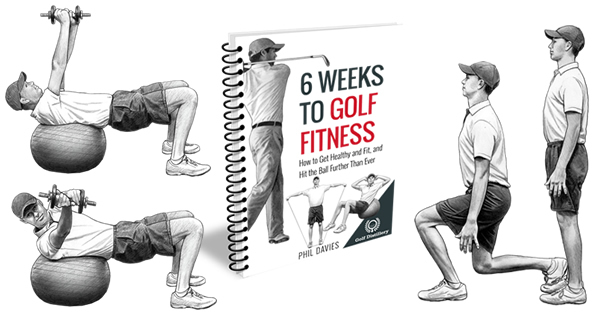 Indeed, by running on a straight line at the base of the fingers the club doesn’t shoot straight down but rather is angled to come down on a smoother incline towards the ground. 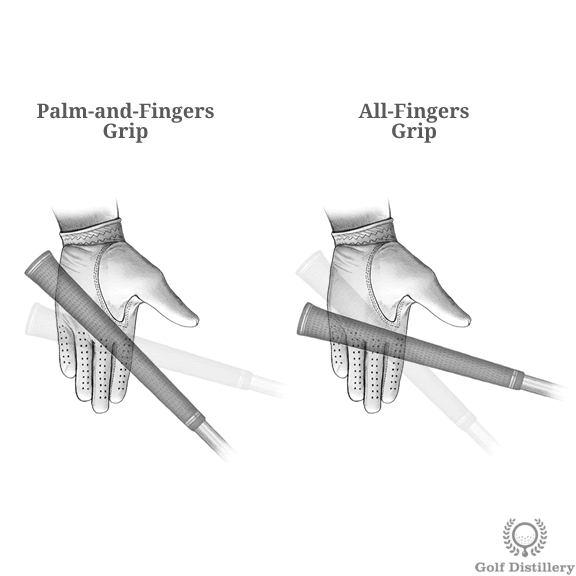 For all types of grips – and therefore true for the palm & finger and the all-fingers grips – both hands should be placed on opposite sides of the grip of the club. 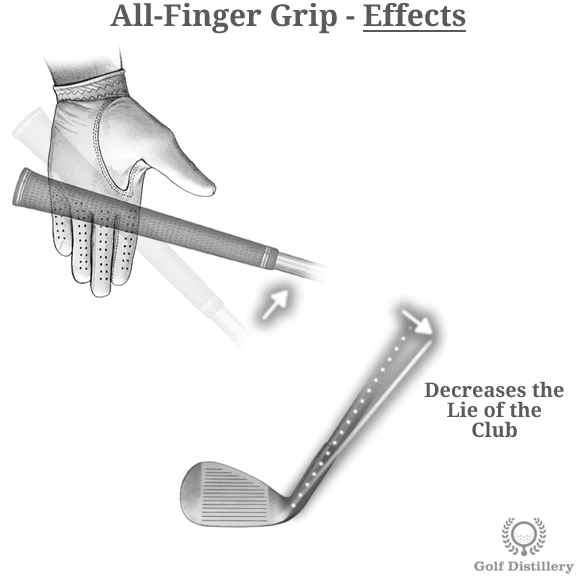 Therefore, the placement of the club as it relates to the right hand varies much less. 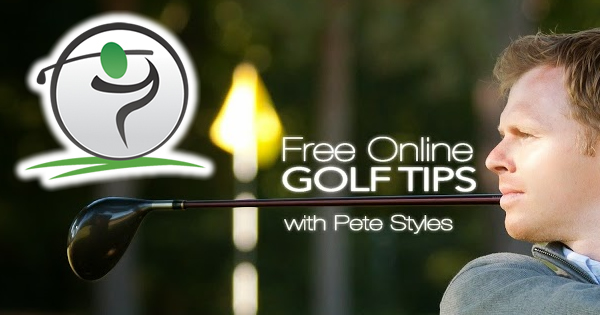 Indeed, start placing the club inside your left hand and when that hand holds the club securely in place, simply place the right over the club and over the the left thumb, making sure the palms of your hands are facing each other from across both sides of the grip. How the right hand connects to the left through the right little finger determines what type of grip you are using. The grip strength variants are explained here.